The Aldyn condominium located 60 Riverside Drive and 62nd street is one of the most notable and superior Upper West Side waterfront condominium developments in Manhattan’s Upper West Side. Built in 2010 with 290 ultra luxury modern residences with unsurpassed level of finishes and amenities on a grand scale, discerning owners have a choice of unique and spacious floor plans designed up to seven bedrooms and sizes upwards of 6700 square feet with stunning terraces and Hudson River water views. 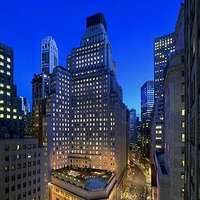 Its location between 62nd and 63rd street is perfectly located in the Upper West Side and a superb and fantastic location mere steps to Riverside Park, Lincoln Center, Columbus Circle and the Time Warner Center with its fantastic restaurants, nightlife, shopping and many wonderful museums, including the American Museum of Natural History and the Museum of Modern Art. You are also mere minutes to spectacular restaurants and eateries like Masa, Jean Georges' Nougatine, Per Se Picholine, Atlantic Grill, Magnolia Bakery. Residents can enjoy a truly cosmopolitan lifestyle at Chelsea Stratus. Built in 2008 and designed by SLCE Architects, this sleek, glass clad 37-story tower is true New York City luxury. Chelsea Stratus contains 204 condominiums, mainly one and two-bedrooms, although there are a few studio apartments and three bedroom penthouse suites available. The Oxford condominium located at 422 East 72nd street in the Upper East Side of Manhattan is a fantastic condominium development affording many of its resident’s exceptional high-rise views of the East River and surrounding New York City skyline in an outstanding white-glove luxury attended building loaded with terrific luxuries and amenities. Built in 1990 with 44 floors and 191 residences it has spectacular modern facilities and services. Upon arriving to the The Oxford condominium you are first greeted by a wonderful landscaped front courtyard with skylight canopy exuding a level of refinement and sophistication. These sun bathed residences range from one to four and five bedroom combinations featuring large spacious floorplans, hardwood floors, high ceilings, large oversized windows and balconies that on the higher floors take full advantage of spectacular East River and Manhattan skyline views. One Riverside Park condominium is one of the newest and most distinguished Condominium developments that is located at 50 Riverside Boulevard and 62nd street in Manhattan’s Upper West Side. Consisting of 219 apartments and 35 floors of exquisite rare homes, the building is situated on the Upper West Side’s river front and brings a very high level of degree of refinement, sophistication and luxury to its residents, enjoying Manhattans waterfront living. The Residences range from one-to seven-bedrooms, including five full-floor penthouse residences, each featuring six-bedrooms with more than 6,000 square feet of living space and breathtaking panoramic views of the New York City Skyline, and the Hudson River with its spectacular sunsets and river views. There are also two unique duplexes each offering a 29' by 12' private pool as well as a 17th floor apartment which also offers a 29' by 12' private pool. One Riverside Park condominium at 50 Riverside Boulevard in the Upper West side is for discerning buyers wanting the riverfront lifestyle with uncompromising level of services and amenities. Downtown by Philippe Starck Condominium located at 15 Broad Street sits directly across the street from the New York Stock Exchange between Exchange and Wall Streets. As the name denotes this luxury condominium was named after one of its internationally renowned creators Philippe Starck and sits in the epicenter of Downtown Financial District. As rich in Pre-war history as 15 Broad Street is, it is equally rich in luxurious finishes and amenities rarely seen anywhere in all of Manhattan. The conversion by Philippe Starck and Leviev Boymelgreen brought a very high level of refinement and services that set a new standard for years to come. Amenities and features rarely seen are a basketball and squash courts, a bowling alley and a lounge - party room that can be reserved for private parties plus a fully landscaped 5,000 square foot roof-terrace boasting a fireplace, reflecting pool, dining tables, and lounge chairs, with sensational views overlooking onto the NYSE, creating a perfect private oasis.